«In 1967, a young Robert Barry spent six weeks on a former racehorse farm in Belmont, New York, as part of an artists-in-residence program sponsored by the Whitney Museum. The documentary photographs he shot during his summer on the farm—a medley of picket-fenced country roads, grazing horses, and artists convening in the converted barns that served as their temporary lodgings and studios—would become the foundation for two formative works: Scenes (1967), a 16mm film (notably included in the Museum of Modern Art’s landmark conceptual art exhibition « Information » in 1970) and Belmont 1967 (1977), a slide-projection combining text and images. Shown together for the first time—along with the seminal film, Red Seconds (1966–1967), and three word-only slide projections (from 1969–1971)—these works form a historic anchor for Barry’s current survey at Yvon Lambert. From an artist known for his conceptual explorations of time—how it is measured, received, visualized, and manipulated—this gathering of Barry’s earliest cinematic experiments combined with his more recent digital videos from the 2000s constitutes a meta-artwork of sorts. Like a time capsule, old and new works intermingle in the gallery evoking thematic and aesthetic connections. Barry’s characteristic non-narrative text and image juxtapositions are established in the first room with Belmont 1967, a slideshow featuring scenes of daily life at the artist colony bracketed by evocative, if enigmatic, words. Color photos—grassy fields, shirtless men gathered near a Volkswagen Beetle, and an un-made bed in a sunny room—are intercut with typewritten words placed center screen such as « hesitate, » « aspire, » « summon, » and « realm. » The customized circular format of the projection and the duration of darkness between each successive slide promote a twofold appreciation of time. On the one hand, time is shown to pass in finite, measurable increments—ranging from the pause following each word and image, to the elapsed decade between when the photos were taken and creation of the artwork, to the forty-five years that separate the viewer from the now-vintage snapshots. Simultaneously, however, the symbolic round cropping of the images and the perpetual rotation of the slide carousel represent time as ultimately interminable and elusive. The installation in the adjacent room considers a more recent autobiographical art world experience. The imagery Barry uses in Art and War (2007) comes from a digital video he shot during one of his own openings. Though the basic ingredients (image and text) remain unchanged since Belmont 1967, the artist’s media and conceptual framework, some four decades later, have become more complex. Here, instead of alternating back and forth between pictures and text, Barry digitally superimposes the two, so that the words comprise the image and vice versa. The black-and-white movie of mingling gallery-goers can be seen only through the frame of thin sans-serif letters spelling out « indefinite, » « questions, » « suddenly, » and so on. « War, » the second half of this work’s title, emerges via the audio track recording of people recounting the precise moment they learned that a loved one had been killed in the Iraq War. These tragic accounts belie the otherwise benign movie, implicating the viewer—whose own activity is mirrored on-screen—in the hereby-trivialized act of art appreciation. By synchronizing two seemingly unrelated episodes, Barry reveals an inevitable concurrence (and indirect correlation) between atrocity and amusement. Barry’s « Comings » (2003–2004), a series of un-edited videos, explore time in relation to travel and linear progression. Coming to an end (2003) shows the final twenty minutes of Barry’s train ride from Brussels to Paris, as seen from his TGV window. 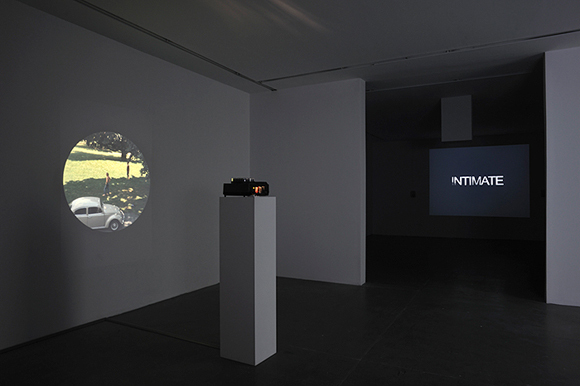 To make Coming over (2004), Barry set a video camera on his dashboard for the duration of the thirty-minute drive from the Museum of Modern Art in New York back to his New Jersey home. Though Barry has gotten fancy with the text display—here, the words appear in a rainbow of colors fading in and out on top of the imagery—the representation of real-time is not all that far removed from the experience established in his primitive 16mm films. Projected on the opposite wall, Scenes (1967) is nearly seven minutes of entirely blank leader punctuated with an occasional image from Belmont. The lack of imagery and the soft whir of the spinning reel draw attention to the film itself as it cycles through the projector on its own real-time (reel time) journey. Perhaps the most poetic temporal musing is Storm (2004), which Barry filmed through his upstairs window during a heavy downpour. From the implied cozy vantage of a suburban house, we watch as rain rustles the leaves and douses the streets below. Every so often cars pass through the two-way intersection and lightning flashes. Over the course of the twenty-minute video, daylight slowly changes, the intensity of the storm fluctuates, and Barry’s oblique blue words fade in and out across the center of the screen at a steady pace: « Because, » « Here, » « Anything… » Meanwhile, the unwavering tree trunk bisecting the frame is a surrogate reminder that though we may stand still, time marches on—long after the storm has passed and the camera has been turned off.» iMara Hoberman is a freelance writer based in Paris. Cet article a été publié le : mardi 15 janvier 2013 à 20 h 04 min. Rédigé par : Liliane. Classé dans : Expositions.